Published on 5 July 2007. The newspaper columnists seem to think that it was a clear Cameron victory: I disagree. I think Mr Brown held his own quite well. He wasn’t as slick, but in many ways that’s probably a good thing. I’d rather see stumblingly straight answers than answers that bear no relation to the question whatsoever. 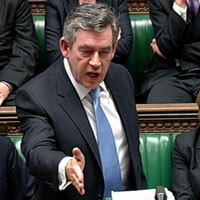 Brown certainly came closer to answering the questions than Mr Blair ever did. Brown’s line about having been in the job for only five days wasn’t the best, but other than that, he held up pretty well. And Ming got to tell a joke, which was nice. Not a great joke, but a joke nonetheless. Not a sharp, to the point joke, but then when does he ever come across like that at PMQs? The whole tone of the occasion was much less gladiatorial than in Mr Blair’s day. None of this “Well, if he thinks that, let me tell him…” – Well, I guess there was a bit of that with quoting each other’s front benches over ID cards, but at least Mr Brown’s responses were largely constructive. It was interesting how much more of a presence Mr Brown commanded than Mr Cameron – and I felt that the latter looked a little more snide than usual. He needs to up his game to meet Mr Brown’s presence and gravitas. Though, interestingly, Mr Cameron is taller, which I wouldn’t have guessed. Random fact, but true. This 1,175th post was filed under: News and Comment, Politics.